More On Ltd has created online store concept and designed the by-products for Mazda. More On Ltd has been handling Mazda’s brand product range renewal, production, online store, logistics as well as storage year 2004-2017. The online store was open for both the Mazda retailers in Finland and the Baltic countries, as well as customers worldwide. The products are designed to support the company’s product brand. 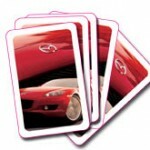 Now you can find Mazda gifts from dealers.